Back in the days when Dennis Miller was funny, before he turned into Howard Beale after Arthur Jensen gives him the corporate cosmology speech in Network, part of what appealed to me about his comedy was that I felt as if I was one of the few who understood most of the cultural and historical references that Miller tossed in his standup as if they were adjectives. Rango plays as if it were an animated film made exclusively for an audience appreciative of that sort of referential humor. As a result, I found the movie very enjoyable at the same time that I questioned if it weren't weighed down by so many allusions and homages that it would fly over the heads of younger viewers. More importantly, would Rango be strong enough to stand on its own if all those clever references were removed and it had to get by solely on what remains? When I was thinking of how to begin my review of Rango and I'd settled on using my Dennis Miller line about how a once sharp comedian turned into a right-wing mouthpiece and compared his evolution to how the malevolent chairman of CCA, the conglomerate that owned UBS in Network, transformed Howard Beale from a latter-day prophet denouncing the hypocrisies of our times into a preacher of corporate evangelism, I didn't even think of the irony that Ned Beatty played Arthur Jensen in Network and also voices the villainous Mayor in Rango. This follows Beatty's great vocal work last year as the bad teddy bear Lotso in Pixar's marvelous Toy Story 3. Beatty could corner the market on voicing the antagonists in animated films. He's always great when he appears on screen, but it's amazing to hear how he can create distinctive characters with only his voice. That aside, on to Rango itself. In a way, besides the plethora of references, I wonder if the filmmakers intended Rango for an older age range. It received a PG rating (though I'm not sure why) but the MPAA details claim it is for "rude humor, language, action and smoking." I bet the smoking pushed it over. 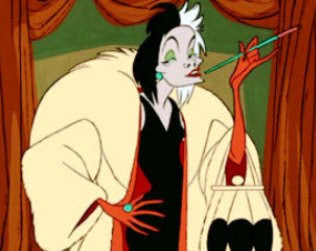 So, should Disney ever revive their great old practice of re-releasing their classic animated films to theaters every few years for new generations, I suppose that 1961's One Hundred and One Dalmatians would have to have the G it received in its 1991 re-release changed to a PG because of Cruella's smoking habit. (The MPAA won't issue any warnings to parents that their children might be influenced to turn dogs into fur coats but SMOKING!) How much further will rating movies for behavior go? There's a big anti-junk food and concerns about childhood obesity going on. If someone eats a candy bar, will that eventually earn a PG? How about the presence of overweight actors? If Jack Black made a completely family friendly film, will he eventually be penalized by the MPAA for being out of shape? I bet they'll never issue warnings for pencil-thin actresses who might subliminally push young girls into having eating disorders. Pardon my digression. As much as I enjoyed Rango, I find myself less interested in writing about the film itself than issues around its periphery. Though my reason for thinking Rango had an older audience in mind is the behind-the-scenes creative team who assembled for it. Its director is Gore Verbinski who helmed the first three Pirates of the Caribbean films (which I only got through an hour of the first one when I realized I had nearly another 90 minutes to endure so I gave up); the god-awful film The Mexican starring Brad Pitt and Julia Roberts, a film whose sole redeeming quality was James Gandolfini as a gay hit man; the American remake of the Japanese thriller The Ring and a couple other less notable films, but nothing animated or truly family oriented among them. Verbinski also gets a third of the story credit on Rango alongside James Ward Byrkit, whose writing credits are puzzlers but longest section on IMDb lists his work in movie art departments, and John Logan, who actually wrote the screenplay. Logan has an extensive resume of screenplay work including Sweeney Todd: The Demon Barber of Fleet Street, The Aviator, The Last Samurai and Gladiator, none of which you see as material aiming for the younger crowd. All though have worked with Johnny Depp, who voices Rango, so I can't help but feel that the film is a bit of a lark for those involved that turned out to be very entertaining, at least for film buffs. However, I can't speak for the young out there, I can only speak for myself and I quite enjoyed Rango. Depp's title character is a chameleon living a solitary life with imaginary friends and dreams of being an actor and a hero. Rango isn't his real name: He'll adopt that later. A series of accidents ends up flipping him into the middle of the desert on the other side of the road from his usual haunts. Parched, desperate for water, he encounters a female lizard named Beans (Isla Fisher) who, against her better judgment, helps him to the closest town with the hopeful name of Dirt. We've had a few allusions already (we've definitely landed in Sergio Leone territory), but once in town, he's not treated kindly by the townsfolk who distrust strangers. We hear obvious echoes of Pat Buttram-esque and Gabby Hayes-like voices among the crowds. When he goes to the bar and someone asks his name, he spots Durango on the bottom of a bottle of cactus juice and just takes the Rango part. Feeling more confident, Rango starts spinning tales of how he is a gunfighter and he once killed the notorious Jenkins Brothers (all six of them) with one bullet. Everyone is impressed, but they also are hurting. Dirt is in the midst of a serious water problem, as in they don't have much if any. They also are terrorized by a real desperado, a large rattlesnake named Jake (voiced by Bill Nighy). What keeps Jake at bay is a hawk who seems to circle looking for him, but the same scavenger chased Rango when he was struggling in the desert and when Rango sees him in town, he runs for it and kills the hawk by knocking the water tower over on it. The town fears for its future: Water already is scarce and now that the hawk is dead, what's to stop Jake, but Rango tells them to have no fear, Jake happens to be his half-brother. They're stealing from everywhere else, why not toss a little Shakespearean element into the mix? At one point, Rango actually tells some of the younger townfolk, "Stay in school, eat your veggies, and burn all the books that ain't Shakespeare." The townspeople take Rango to meet the Mayor, who seems a friendly enough chap, saying Rango is giving the town hope and appoints him sheriff. The Mayor, an old turtle scooting around in a wheelchair he certainly must have obtained from Mr. Potter in It's a Wonderful Life says at one point that he "who controls the water controls everything" and Beatty even puts a slight bit of John Huston in his voice. In fact, Rango appropriates the plot of Chinatown more than any other film, so much so that I wonder if Robert Towne should sue. 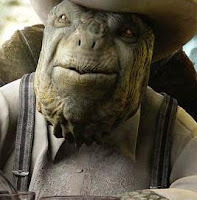 On the plus side, the Mayor doesn't have a daughter that he fathered a child with that Rango falls for and the movie doesn't end with "Forget it Rango, it's Dirt." It's interesting that Rango is at least the second film involving animation that adopts a Chinatown-like plot to its tale, the first being Robert Zemeckis' great Who Framed Roger Rabbit with its plan to destroy Toon Town for the L.A. streetcar. The plot plays out as you would expect, though Dirt seems to exist out of time. It's an Old West town free of technology, but Rango crossed a highway full of cars to get there and when he figures out where the water is being diverted to, over a dune he spots Las Vegas. 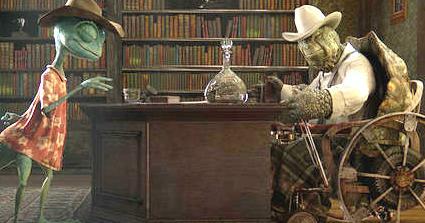 Plot isn't what's charming about Rango though, it's all the extras that make it so much fun. In addition to the obvious references to Chinatown and Leone's spaghetti Westerns, they manage to sneak in allusions to The Court Jester, Easy Rider, The Lord of the Rings, Fear and Loathing in Las Vegas and, when they get to the big climactic assault/chase, Francis Ford Coppola's Apocalypse Now, even using Wagner's "Ride of the Valkyries." Late in the film, when Rattlesnake Jake shows up and exposes Rango's stories about the Jenkins Brothers as lies, Rango dejectedly leaves and hallucinates a visit from The Man With No Name, riding around the desert in a golf cart. I actually thought at first that Clint Eastwood had done a vocal cameo for the film (which would have been really cool), but it turns out that it's only a pretty damn good impression of Eastwood by Timothy Olyphant. Is Rango a great film? Not really. Is it a fun film? Yes, especially if you know a lot about movies. It's also exceedingly well made on the animation side. It wasn't made or converted to 3-D as all animated films seem required to be now, but even watching it at home, the depth of its images and its fine use of colors and shadings would be one of the greatest arguments as to why you don't need the money-grubbing gimmick in the first place. In addition to Depp and all the other great voicework I've already mentioned, Rango also includes nice vocal turns from Abigail Breslin, Alfred Molina, Stephen Root, Harry Dean Stanton, Ray Winstone and Ian Abercrombie.